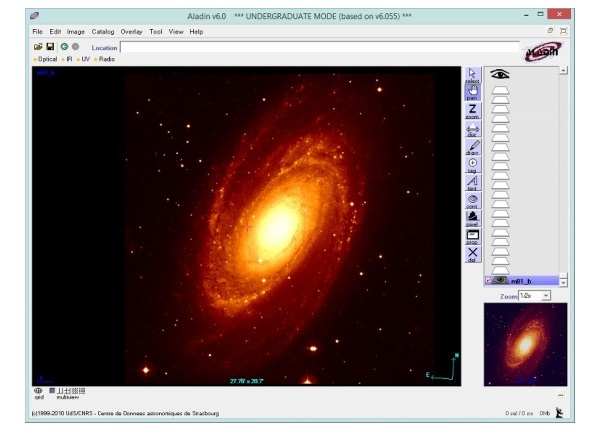 As part of my Open University course, I’m required to use a piece of open source software called Aladin Sky Atlas. This is maintained by Centre de données astronomiques de Strasbourg. The program itself is actually pretty cool – it’s an interactive sky atlas, which allows you to view astronomical images along with information from the SIMBAD database and other sources. The only problem with this program is that it uses Java, something I tend to avoid whenever possible. Installing Java on my Surface Pro 2 would mean I’d have more critical patches to install than I already do, and would open me up to a whole new attack vector. It’s not something I’d want to run on a tablet computer either. I originally tried using Hyper-V with a virtual machine running CentOS. This is a nice clean way of having ‘nothing running’ until it’s actually needed, but it’s quite an overhead to run a whole Linux operating system just to host a single app. Especially when battery life is a concern. When searching around for a solution, I stumbled upon a really cool project that I’d never seen before. The IKVM.NET project includes a number of components for Java & .NET interoperability, but for this task I’m mostly interested in the Java Virtual Machine implementation. By downloading the Windows binary of IKVM.NET, I’ve been able to run the application on my Windows 8.1 machine without requiring the JVM (or any other software) to be installed at all. This is a pretty fantastic achievement. First I put the binaries into my apps folder (similar to my Vim setup), then I set up an alias to the executable using PowerShell. # There's usually much more than this in my profile! After creating an alias in PowerShell I can just run it whenever I need. Obviously you could always set up a Windows Shortcut that does a similar thing, but that’s boring. Using PowerShell really suites me, as I often run applications this way. The software doesn’t exactly look pretty, but these open source projects rarely do. Sometimes it looks like text hasn’t rendered as expected, but overall I’m really impressed. If you’re looking to run JAR applications on Windows, without the Java Virtual Machine, then have a look at The IKVM.NET – it might work for your apps too.